A 51-year old man presented with a 5-month history of acute pain bilaterally on the posterolateral aspect of his hip. In his history he revealed that, at an earlier stage, this symptom had persisted for 2 days without radiating to bilateral lower limbs and had got relieved by itself. He had been diagnosed as having protrusion of the lumbar intervertebral disc at a local hospital based on his radiological examination. Approximately 2 months prior to admission, the pain appeared again and progressively radiated to bilateral lower limbs especially on the right side that started severely restricting his movements. Neurological examination revealed that the Lasegue sign was bilaterally positive, along with mild motor weakness, without tendon hyperreflexia and/or the presence of any pathologic reflex. The magnetic resonance imaging (MRI) of his lumbar (L) spine showed a heterogeneous enhancing, intradural-extramedullary mass at the L2 vertebral level [Figure 1]. A L2 laminectomy and microsurgical excision of the lesion were performed. A dark-red, 20 mm × 12 mm × 10 mm, well-circumscribed mass was identified after opening the tense dura. The mass was densely adherent to the adjacent nerve roots. There was a single thin nerve root that was traversing through the capsule of the lesion. The adhesions of the lesion to the adjacent nerve roots were carefully dissected and the lesion could be removed completely after sacrificing the nerve root [Figure 2]. 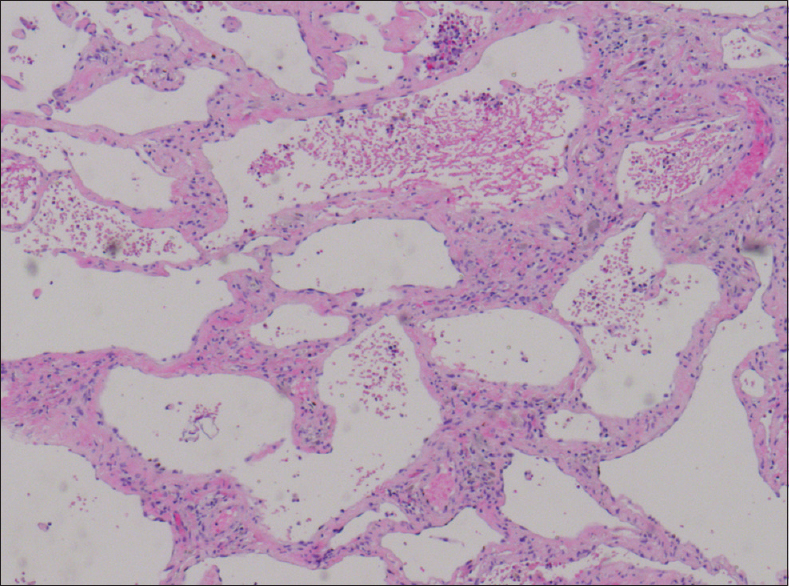 The surgical specimen was consistent with the diagnosis of a cavernoma [Figure 3]. The postoperative course was uneventful and his symptoms of radiculopathy regressed. Cavernomas can be found in all regions of the central nervous system, especially the cerebral hemisphere; however, they are quite rare in the intradural extramedullary space. Only a few intradural-extramedullary cavernomas (including the present case) have been documented in the entire vertebral canal. The symptomatology of intradural-extramedullary cavernomas depends on their size and location. The most frequent clinical symptoms result from local compression of the nerve roots and/or the spinal cord. Due to lack of special features of these lesions, it is difficult to preoperatively diagnose them and distinguish them from other intradural-extramedullary tumors such as a neurinoma or a capillary hemangioma. In our case, based on the clinical symptoms and imaging, a neurinoma was considered; however, the postoperative histopathological examination confirmed the typical features of a cavernoma. The histopathological examination serves as the 'gold-standard' modality for diagnosing this lesion; however, the magnetic resonance imaging is also fairly accurate in diagnosing these lesions., A well-defined mass with mixed signal intensity on both T1- and T2-weighted images (due to the presence of mixed subacute and chronic hemorrhage) may be characteristic of a cavernoma. The nonenhanced MRI typically shows a heterogeneous iso-to-hypointense area on both T1- and T2-weighted images without significant contrast enhancement, when compared with the normal intensity signals of the cord.,, More importantly, the lesion may often be detected to be surrounded by a hypointense ring on T2-weighted images owing to hemosiderin deposition. Oppenlander ME, Kalani MY, Dickman CA. Spinal and paraspinal giant cervical cavernous malformation with postpartum presentation. J Neurosurg Spine 2012;16:447-51. Cecchi PC, Rizzo P, Faccioli F, Bontempini L, Schwarz A, Bricolo A. Intraneural cavernous malformation of the cauda equina. J Clin Neurosci 2007;14:984-6. Nozaki K, Inomoto T, Takagi Y, Hashimoto N. Spinal intradural extramedullary cavernous angioma. Case report. J Neurosurg 2003;99:316-9. Petridis AK, Doukas A, Hugo HH, Barth H, Mehdorn HM. A rare case of extradural lumbar nerve root cavernoma. Eur Spine J 2011;20(Suppl 2):S348-S9. Santoro A, Piccirilli M, Frati A, Salvati M, Innocenzi G, Ricci G, et al. 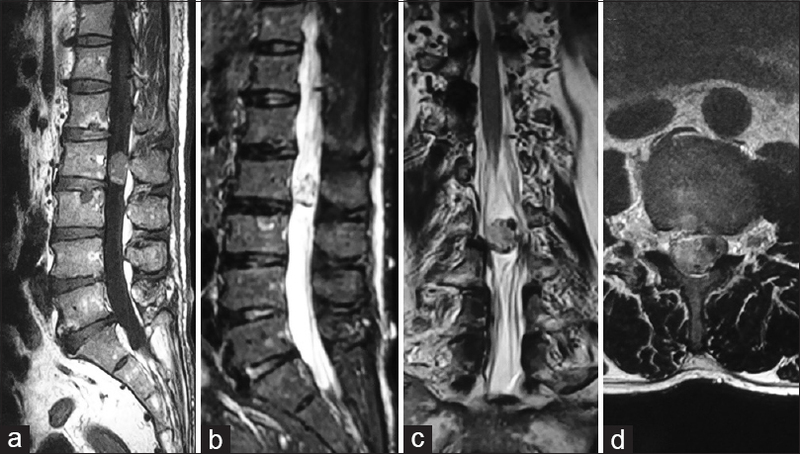 Intramedullary spinal cord cavernous malformations: Report of ten new cases. Neurosurg Rev 2004;27:93-8. Cervoni L, Celli P, Gagliardi FM. Cavernous angioma of the cauda equina: Report of two cases and review of the literature. Neurosurg Rev 1995;18:281-3. Er U, Yigitkanli K, Simsek S, Adabag A, Bavbek M. Spinal intradural extramedullary cavernous angioma: Case report and review of the literature. Spinal Cord 2007;45:632-6. Crispino M, Vecchioni S, Galli G, Olivetti L. Spinal intradural extramedullary haemangioma: MRI and neurosurgical findings. Acta Neurochir 2005;147:1195-8.